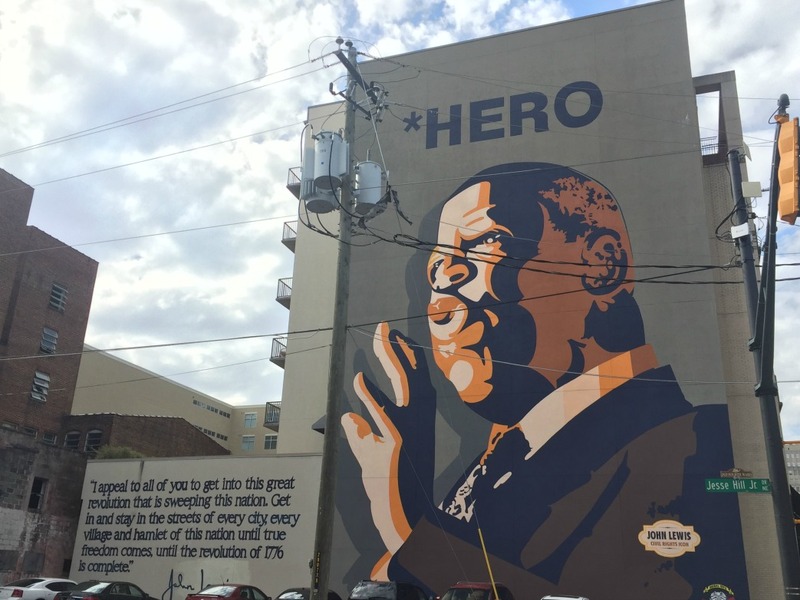 This year, Facing Race was held in Atlanta, known as “the cradle of the civil rights movement”. It was the morning of Nov. 9, 2016 and I was boarding an Atlanta-bound flight for Facing Race, the largest racial justice conference in the country. What did it mean to begin the daunting task of “facing race” the morning after Trump’s surprise victory? One thing has become clear: resistance to Trump’s extremist agenda is finding the right messages, and messengers, to seize a turbulent news cycle. More is required of us. Some of us have a lot to lose, and we need to uplift the voices of the most impacted people. Being among a beautiful, wise group of thousands of racial justice advocates helped salve my scrapes and bruises from the campaign season. Hearing more about the work of advocates from around the country gave me hope and direction in a bleak time and reaffirmed the work Resource Media is doing internally and externally to focus more squarely on social equity. This is an all-hands-on-deck moment for progressives. Two conference speakers in particular–Roxane Gay and Alicia Garza–captured the zeitgeist of the moment. “I’m done with people who allow themselves the comfortable distance of allyship,” Gay said, speaking with disappointment for people who stood up for her only when it was convenient. “We’re not being attacked the same, but we’re all being attacked,” Alicia Garza said on another panel, stressing multiracial solidarity. We need to step up our game when Trump maligns those we love. As Linda Sarsour said at the conference, we can’t afford “Oppression Olympics,” competing with one another over who is most oppressed, or “part-time progressives,” people who only speak up when convenient. Now’s the time to consider how you can spring into action. More is required of the media too, so let’s give them a hand. 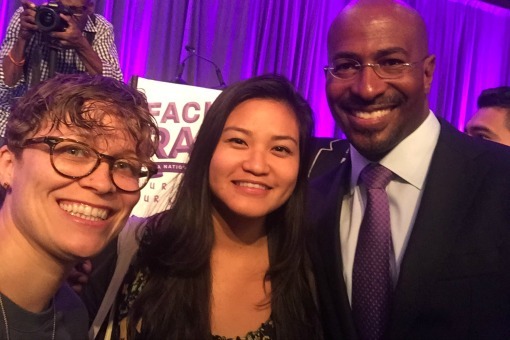 Resource Media staffers Marla Wilson and Sarah Shimazaki with Van Jones. Trump is obsessed with the media, and journalists are a front line of defense against this administration’s abuses. We need to ask more of journalists. If the “front door” is blocked, get more creative. Don’t apply the same transactional approach to a new era. Unearth untold stories to put a face to policy decisions and interrupt false narratives about immigrants, refugees, Muslims, and other scapegoats. Even before the President declared the media an enemy of the American people, journalism was a beleaguered industry. As advocates, we can proactively help our favorite journalists find the scoop about how Trump’s policies are affecting local families. We can livestream events through Facebook Live to pull in reporters and other viewers, and we should engage the expanding realm of independent, niche, and investigative media–including Refugees Deeply, Investigate West, and Unicorn Riot, to name a few. Research shows one way to weaken support for wrongheaded policies may be to push people to actually consider the nitty-gritty details of implementing them. To empower reporters to cut through the other side’s spin, try giving journalists questions to ask to make the other side explain themselves. If the resistance isn’t intersectional, we aren’t trying hard enough. 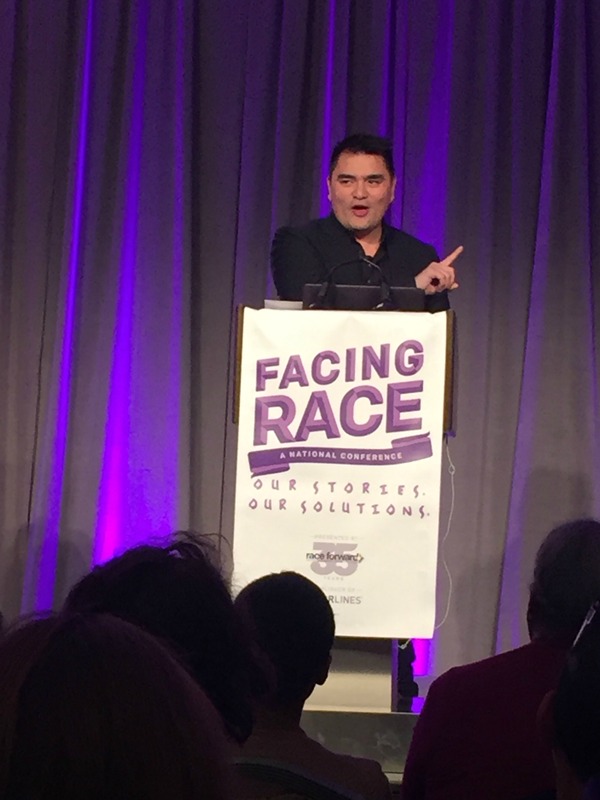 Jose Antonio Vargas– journalist, filmmaker and immigration rights activist. If we believe in social justice, we need to hold hands across the differences that have kept us divided–even when it’s tempting to cut and run. In other words, we need to build a wildly “intersectional” social change movement that acknowledges the rich complexity of our lived experiences. It will mean environmental advocates tweeting that undocumented people are #HereToStay, and queer activists saying #BlackLivesMatter. It’ll mean knitting pink hats for the next Women’s March, putting your Senators on speed dial, or protesting at your local airport when detainees are held. While we’re at it, let’s also welcome newcomers. For communicators, our task is to think about not just what needs to be said but who should say it. Some of the most powerful messenger-message combos involve people speaking straight from the heart, straight from their own values, sharing their visceral, unscripted truths–not their “facts.” This could be the Iowa pig farmer who relies on ObamaCare, the Muslim man who took two bullets as a wartime translator, or the unemployed Kentucky grandma struggling in coal country. It’s by stitching together seemingly disparate stories like these into a narrative that we’ll win. Trump’s narrow win wasn’t a repudiation of forward-thinking values, but it was the last gasp of a movement that seeks to drag us back toward a time when fewer people thrived. We can’t afford to shrink from our core values or spend time dwelling in the opposition’s frames. “We have to double down and show what deep solidarity in practice looks like,” Alicia Garza said at Facing Race. “We can’t be siloed out of fear.” As communicators and progressives, we don’t have the luxury of staying in our own lanes anymore. As Trump’s agenda evolves, so must we.